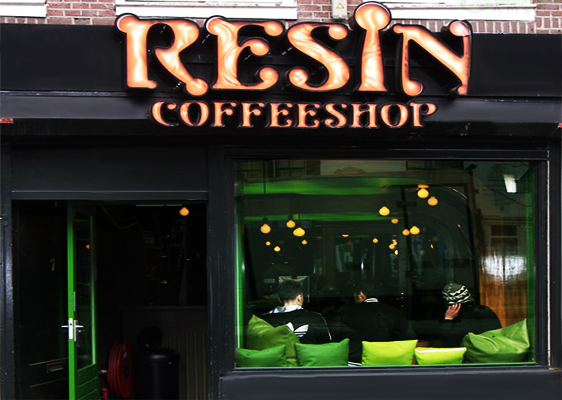 Bang in the centre of Amsterdam, Resin is one of the latest coffeeshops to open its doors. Situated just off Nieuwendijk shopping strip, Resin is perfect for a quick smoke if you’re on your way to or from Centraal Station, or need a quick pick-me-up after a tiring day shopping. When we say Resin is a very green coffeeshop – we really don’t just mean because of all the weed! Personally, I think it’s easy on the eye when you walk in and chill, but maybe if you hate the colour green you should avoid Resin. Green lights, green walls, green benches, green stools, green tables, a couple of green swings.. How you’d imagine Kermit’s bachelor pad. Resin is more frequently used by the tourists and the menu goes something like… White Widow €8.50 per gram, Afghan hash €6.50 per gram, space cake €5 to name a few. Resin is divided in to two, unlike most coffeeshops, there’s a room for those of you who smoke pure, and a large, comfy mezzanine at the back where you can mix your choice of smoke with tobacco. You can use Resins small selection of smoking accessories while you sit back and enjoy the wonderful music combination played inside.